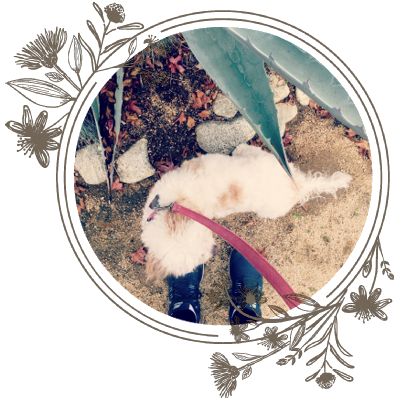 I thought I would share the project I was working on so diligently while Rembrandt was working on the sofa and chair.� But first, a back story. 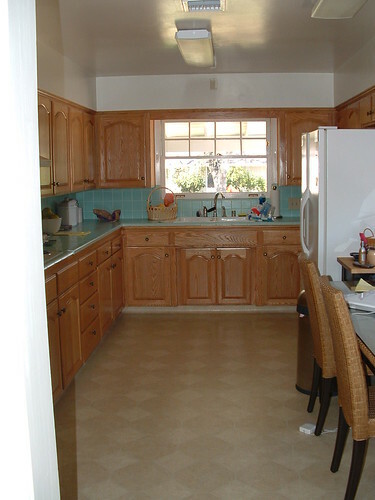 When we moved into this house four years ago, we knew we would have to remodel the kitchen.� The turquoise tile was original, as was the buttercup yellow stove.� The oven was a 1970s brown beast, and the cabinets were 1980s refaced country wonders.� I’m not opposed to keeping original fixtures, but the kitchen had become a hodge podge of decades and I wasn’t about to add to it.� Plus, I was practicing as an attorney; we had the money to put into a new kitchen.� That is, until I decided to become a stay at home mom in the middle of the remodel, a decision I’ve talked about before.� We made compromises and downgraded the appliances, the floor, and put off the back splash.� That was four years ago. Since the Mister was laid off last January (and his new job isn’t anywhere near his previous salary) we still don’t have the money for a proper back plash, but after four years I’ve grown tired of staring at a bare wall and decided that I would have to do something, preferably with items I already possess.� I didn’t have a pallet of subway tiles in my garage, but I did have boxes of pictures from our grandparents dating to around the 1940s.� I’ve been holding on to them, not sure how I would use them, when it occurred to me one day that I was looking at my back splash. A quart of Ralph Lauren paint in Polo Green (my new favorite color), some IKEA frames, and an afternoon spent looking at pictures of a grandmother I’ve only seen a handful of times because we live (sadly) in two different continents gave me a new-to-me back splash that I love. I hung five pictures dating back to the 1930s of my family on the left. And five picture of The Mister’s family dating back to the 1940s on the right. The paint is a gorgeous, inky color that changes with the light. It’s black, it’s green, it’s blue. Here is a great example of the difference between morning and late afternoon light. 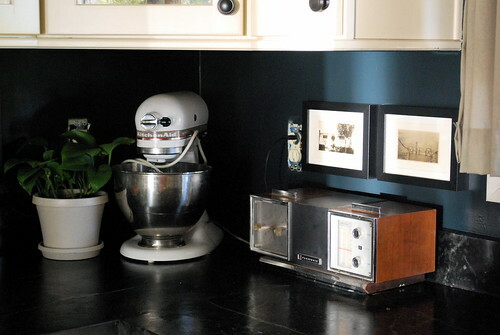 The only thing left is to hang some vintage post cards of Buenos Aires I found on ebay, order and install a two 3 gang-way switch plates in black, new window treatments, and find something to place over the stove. Any suggestions for the stove or window treatments? You know how I love me some links. this is absolutely gorgeous! I actually had to scroll back up and take a look at the “before” pictures again, just to make sure it was the same kitchen!! I bet you can’t to start cooking some delicious meals in your new kitchen. I just love that back splash. Beautiful. And the family pictures is an amazing touch. i love it. it’s gorgeous. you’re a genius. i love it even more than white subway tiles. O.M.G. I’m in inky green love! Are you kidding me? This is adorable. Oh, I forgot. I also need to work on the little eating area to the right. I just can’t figure out what to put in those little shelves. Thank you, everyone! :) For a cheap fix until we can get a proper back splash, I am happy with it. I looooove that dark color! I would not have been bold enough to try it myself, but good for you. I’m sitting here thinking, “where could I use that color?? ?” Maybe the powder room…? I love it, Jules, and it doesn’t look like a cheap fix at all. The “after” pics are very striking. I’m so impressed!!! Wow — what a transformation! Although I’d have been tempted to retain the aqua. Knowing me, though, I’d probably have ripped out the perfectly serviceable tile and replaced it with some obscenely costly glass terrazzo in the exact same color. Love it! Why do you need new window treatments? How about a piece of stainless steal screwed to the wall behind your oven? I love the industrial look of it and it’s super cheap. You could maybe even find a thick piece of flashing at Home Depot. I will see if I can find a picture and send another post with a link. I love the color!! LOVE it! Gorgeous! Since I am also staying home we are having to manage the budget for the house much differently than before–and this old house needs updating! Love the paint–it is great how it changes in the light. Thank you for the inspirational blog. What a great fix! We are beginning our own kitchen remodel–picking out cabinets tonight! Your kitchen is very similar to what we’re looking for. Would you mind sharing what your countertop is? beautiful! however, i loved the turquoise tile…. is that marmoleum on the floor? i love the pictures and the old radio. I LOVE everything about it! The contrast of the white cabinets against the dark wall is spectacular, especially with the sleek stainless appliances popping out here and there. And I would kill for your apron front sink! Well done! Nichole–I don’t like my window treatments! I just think they look blah, and that maybe I could use some pattern in there? No? 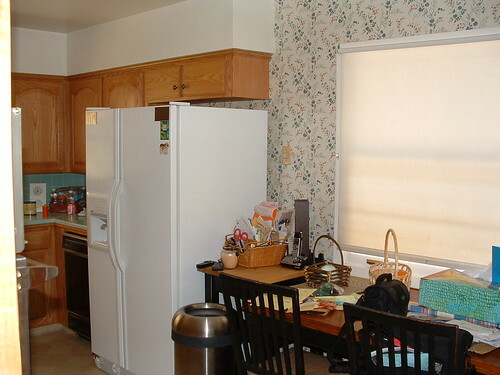 Nina–I love roman shades, I was thinking of that over the apron sink. Laura–I am trying to convince The Mister that this color needs to be in the adjoining pantry/laundry area. 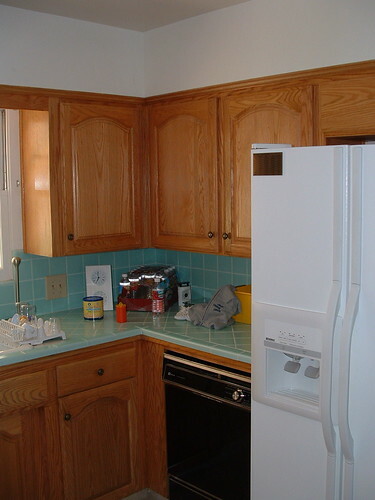 With all the white cabinets, white washer/dryer, some fat wood open shelving…I think it would look really cool! He’s not convinced. But, he didn’t think my idea of the black back splash was all that hot, either. So I waited until he was out of town to paint. I knew if I tried to do it with him there, his skepticism would make me lose my nerve. Fififoto–It was a beach glass green for a long time. I thought aqua was a color I wanted all over the house (and started decorating that way, too) but I am slowly figuring out what I like, and it’s looking like high contrast, dark colors, etc. Christian T– I was thinking about something like that! I was also thinking of a silver platter or regular white plates or platters. But, you may be right. 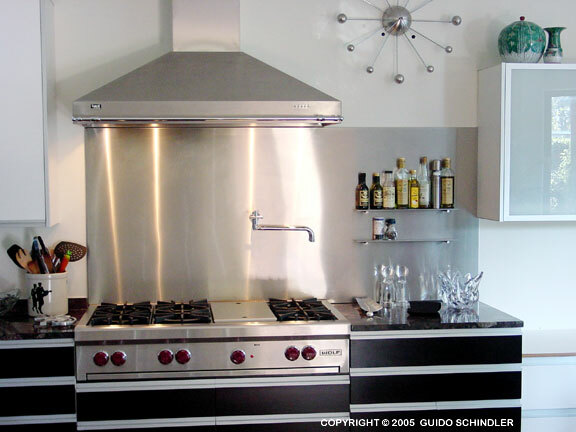 The contrast between the sleek stainless steel and the kind of country look of the kitchen might be really cool. And, it’s cheap! 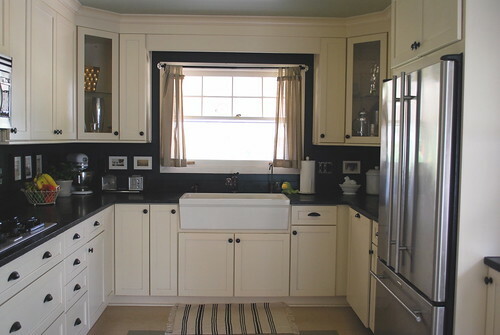 Melissa–The countertop is soapstone, and I believe the variety is Green Venata. We wanted it because it is not shiny. You oil it like butcher block, which gives it a soft, pretty glow. It cost a fortune, but I was working at the time. Alja–I wish it was marmoleum! I couldn’t get anyone to come out to where we live for such a small job. True linoleum products weren’t popular for residential use 4 years ago in my area. Come to think of it, it’s still not popular. Most people still like the big tiles and hardwoods. Anyway, it ended up not mattering because I quit my job so we couldn’t afford the cork or marmoleum we wanted. It needed to be a very thin flooring because we have a pocket door that isn’t in the picture. What you see is plain ol’ $0.25 VCT floor tiles. The type of flooring you see in Target or your supermarket. It cost about $200 for the entire floor, including materials. It turned out to be one of my favorite parts of the kitchen. Ah, soapstone! 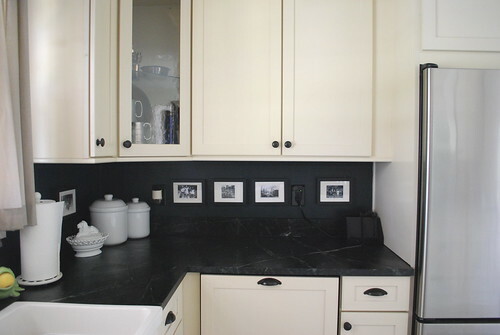 Every time I see a countertop I like–it’s soapstone. I would prefer not-shiny, too. Chances are it won’t be in our budget, but maybe I can cut something else! Thanks for sharing! Melissa–Soapstone was pre-SAHM, and it is very expensive! I heard installation is pretty easy if you are handy. Have you considered walnut, with a tung oil finish? Or even super varnished, like a boat? That was another material I was considering. I also looked into Richlite (paper counter tops) and honed granite. Sometimes I wish I went with the walnut butcher block counters. They are so pretty and warm looking! I like the style of your curtains, but you could do something with a mid century vibe to go with the amazing radio you have… Do you like that style? I get the impression you do because of your couch (the one that your little man colored on). There are soooooo many amazing fabrics out there and I think bringing in some color would be nice! I will see if I can find you some links. Here are some fabric links for you. It looks awesome and brings more light in! I’m digging the colors….lovely! So your paint color was actually a dark green? Because to me it almost looks dark navy. I LOVE the way your color looks in your kitchen and I have been toying with the idea of updating my kitchen. Love the idea of a bold color. I just want to know if it is throughout the whole thing or just the backsplash? Holy bananas that’s awesome. LOVE EVERYTHING ABOUT YOUR NEW KITCH MAKEOVER! Sorry for the shouting, I just can’t help myself sometimes. What a great idea for a back splash! And it makes it so much more personal. Love it! It was cute before, and it’s fabulous now! What a gorgeous transformation, and I love, love love that paint. How did you find it?? I helped my parents choose colors for their kitchen makeover a couple years ago, and I remember it being painful trying to negotiate between shades just a smidge off from each other. You managed to find the best of both worlds…excellent!!!! breathing fast! I love (underlined) your sink!!! I think the paint is fantastic. What I think is really funny to me though is that you have room in your kitchen cupboards for chatchkes like framed pics and vases where mine are jammed full of kitchen items. Ah the luxury. Enjoy that!!! It looks great! Esther–I love Smith & Noble. Thank you for reminding me of them! Christian–You have me convinced that a roman shade or similar is the way to go. Thanks for all the links! I love all those fabrics. Katie–It’s a dark green. But, in some lighting (as you can see for yourself) it looks blue-ish. It’s really a dark, inky color. Right now, 4:00 PST, it looks like a dark charcoal color. The color is only on the back splash. I want it everywhere, but my husband isn’t so sure. I want to extend it into the laundry room/pantry, too. He thinks it’s too along the back wall we have, but I think it will look nice, especially if we install beadboard beneath it to break up the green/black. Thank you, Sherry! You and John have been inspiring me lately to get off my duff and start working around the house. Mary–I got it at Home Depot, and it was easy to find since I knew what I was looking for. What you can’t tell in the pictures is that my counters are also a green so dark it’s almost black. I mean, really, really dark green, but green nonetheless. So, I knew I had to get a similar green/black color. Ralph Lauren is my go-to brand for paints, and this is the first paint chip I saw. I was so confident it would work that I bought it without even going home to compare it with the counter! Maybe not the smartest thing to do, but there you go. I check all the other brands first and even went to Lowes, but I didn’t like any other color as much. Shari–ebay! And as for the chatchkes? I’m not so sure I would go that route again. It’s something I always wanted, but it is a phenomenal waste of space. Besides, I’m not even good at displaying chatchkes! just discovered your blog the other day – followed a link on that permanent marker situation, and wow, i was hooked! serious high five for getting the sofa + chair clean!!!! 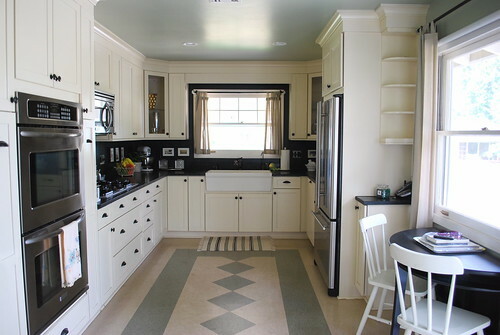 i just looooove to see before + after shots of kitchen remodels. 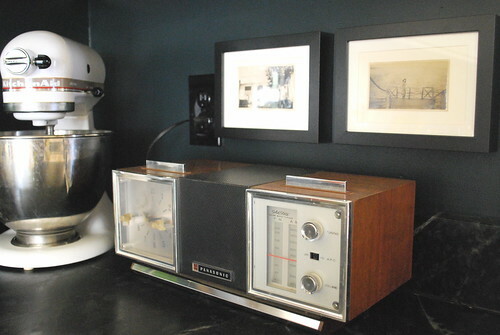 someday we will really bite the bullet and do ours– we have 1960s original appliances (burners are starting to flake out) and blah ugly 80s linoleum floors. 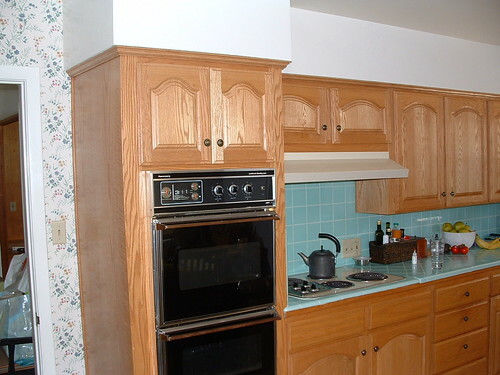 plus dated (yet solid) wood cabinets… i am curious about your cabinets- did you guys just reface them? or are they brand new cabinets? this is something we want to do (reface, paint, something) but feel intimidated as all get out over the job. the kitchen looks GREAT. i love the dark color you chose! Jenny–Thank you! We bought our cabinets online through buycabinets.com. Unfortunately, they went through Chapter 7 bankruptcy this year, so they are no more. Bummer, because I have a problem with the finish on one of the cabinets. I’ll have to go to Kraftmaid directly, I suppose. Absolutely LOVE it. Love love love, want it in my own house! My jaw dropped when I saw the two, the difference is remarkable! Looks fantastic! I vote for a nice, textured wood/bamboo/or grass shades. Jules… OMG.. you and I are such on the same wavelength when it comes to style!!! I thought I was the only person who has a white (well, more like cream, but when I ordered it, it was supposed to be white??) couch, yet longs for deep, dark colors to match it (accented by a few lighter shades of blue)!!! Awesome.. I really like it. I love the contrast.. I think I’d probably go with the stainless like Christian said… since there’s already so much white with the cabinets and accents.. 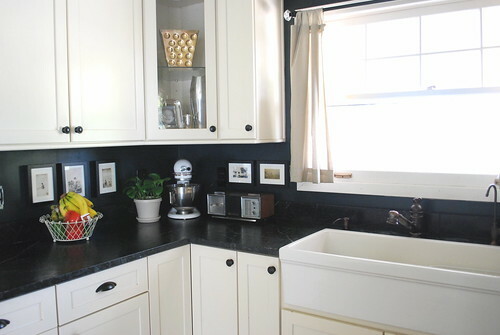 I never would have thought to paint a kitchen black, but it’s really very nice and not at all overwhelming with those gorgeous white cabinets to balance it all out. What a bold move – it totally works and looks very sophisticated. I would love to spend every morning and meal making time in that kitchen. WOW! You did a fabulous job! Wow, your kitchen is absolutely amazing! I may have to use that color in my house – in fact, I just wrote a post about it. 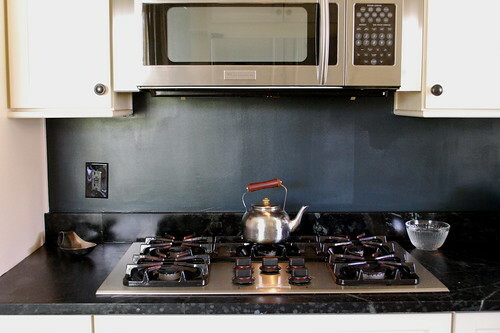 You could do a mosaic tile panel that you hang on the wall behind the stove that you could take down easily if/when you decide to tile the whole backsplash. http://www.mercurymosaics.com has great mosaics and it’s all custom, so you can have them make a panel your exact dimensions using any mosaic or combination of mosaics and field tile. I’m an interior designer and live in a condo that we will outgrow in a couple of years, so that’s what I’m doing for my backsplash (and the rest is painted a dark inky blue/black color (Benjamin Moore AF-565 Mysterious in the Aura collection). I think a 30″ x 18″ panel would be about $500. Feel free to email me with any questions. Great work, by the way, the kitchen looks gorgeous and not at all like you compromised on budget! I just stumbled across this site and was impressed by the paint job behind the radio that changes w/light….blues and greens are very soothing to me and I was wondering what color/brand it was…. I love your kitchen! I’ve been wanting to redo mine since we moved into this place, and have been looking for ideas. I love the colour scheme of yours, it’s so elegant and clean. My husband likes it too, so I’m going to try and incorporate that colour scheme into my kitchen. Not quite sure how I’ll do it so that the black doesn’t overpower it, as mine doesn’t have the top cabinets to balance the black out. I’m sure I’ll work it out by the time I can afford to redo it. ;) I do have 2 questions for you if it’s okay. Is it just me or does it give the impression like a few of the remarks appear like they are coming from brain dead folks? :-P And, if you are writing on additional sites, I would like to follow you. Would you list the complete urls of all your social pages like your twitter feed, Facebook page or linkedin profile? regards to this, just like you wrote the e-book in it or something.